I’ve been on holiday and I’ve had a hectic few weeks with appointments and things but today I’ve got a lust-worthy interior wishlist for you. Spring is officially here and I am obsessed with DIY and doing up our house. My plan this year is to get our bedrooms decorated so we are starting with the office as it’s the smallest and after arguing discussing at great length how it was going to look we have finally decided on paint and paper, so here’s a few bits and bobs I’ll be wanting to pop in the rooms once it’s complete. The office is going to have an outdoorsy kind of theme. Harry likes historical pieces, militaria and other sorts of quirky pieces so I’ve picked out a few finishing touches including this Globe from Dunelm. John Lewis also had some globes but they were quite expensive. Last year Dunelm had the stag pieces in but I couldn’t get hold of the small one, so I’m chuffed they’ve brought them back this year and this time I won’t miss out! I’ve also seen this cool picture of the worlds oceans from B&Q of all places. I didn’t really know they did homeware but I really like this print. As the office is going to have blue accents I’ve picked out this blue lampshade from John Lewis which will cover the hideous light without making the room too dark. Once our office is decorated I’ll be putting shelves up as there are none currently and it’ll be good to store our books and other nick-nacks. Ikea have got some great floating shelves so I’ll definitely be picking up a pair. There are a couple items I’ve chosen which aren’t going in the office – this gorgeous leaf and glass light fitting from Dunelm is probably going to go in our living room. I’m really not a fan of pendant lights so I think this will look fantastic. Also the Sunset beach and the Venice print will be dotted about the house probably in the other bedrooms to give a nice soft feel. Have you been doing any decorating or DIY this year? 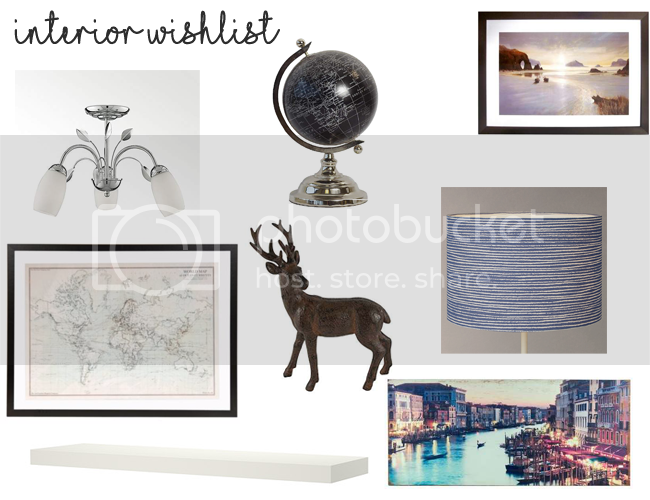 Stay tuned for another wishlist soon when we start on the guest bedroom! Dunelm is amazing!! I always want to buy everything! Love the globe and lamp!